Kyoto-based tenmoku specialist Kamada Koji has chosen to work exclusively in the very difficult world of tenmoku where he has gained a reputation as a perfectionist. Tenmoku (also spelled "temmoku") refers to a mountain between China's Zhejiang and Anhui Provinces and is the Japanese pronunciation of Mt. Tienmu in Chinese. The original name for these wares in Chinese was jianzhan. The first mention of tenmoku in a Japanese document occurs in 1335 in a record by Onkei Soyu, a monk who studied at Mt. Tienmu. Japanese Buddhist monks brought Tenmoku wares made at kilns in Fujian Province in the 13th century back to Japan. The Ashikaga shoguns held tenmoku and seiji (celadon) in the greatest esteem and this reverence reached its peak during the reign of the shogun Yoshimasa, the eighth shogun. From that time in history, only four "yohen tenmoku" tea bowls are known to have survived, and all of them are in Japan -- three are designated as national treasures. These three are, respectively, in the Seikadou Bunko Art Museum, the Fujita Art Museum, and the Ryuukouin Subtemple of Daitokuji Temple. I believe Kamada's tenmoku are equally impressive. There are a few kinds of tenmoku, in particular, yohen tenmoku and yuteki tenmoku. 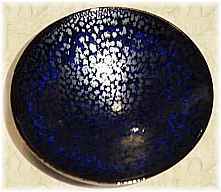 Yohen (also spelled "youhen") refers to changes that take place in the kiln, and it is also used for Bizen, where the glaze runs during firing. Sometimes this is called a 'hares-fur' effect. 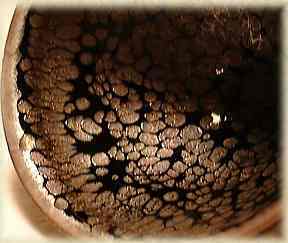 Yuteki is an oil spot effect that occurs when there is an overload of iron oxide which is allowed to cool slowly and forms effulgent spots on the surface. It is a very difficult technique and one in which Kamada excels as is evidenced in the fine guinomi pictured below. It is perfectly potted and has a slightly everted drinking lip. The other cups are a yohen tenmoku guinomi with its bronze tinged lip and a rare blue-body yuteki tenmoku. 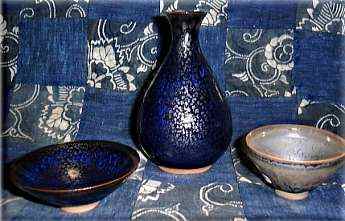 The sake flask (tokkuri ) and the foliated serving dish (hatchi) also have the blue tinges in their bodies. 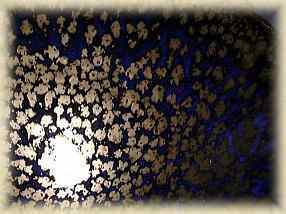 Kamada's tenmoku are magical and the sake cups when filled are mesmerizing; just like looking up at a brilliant night time star-filled sky. Only this sky is in your hands. 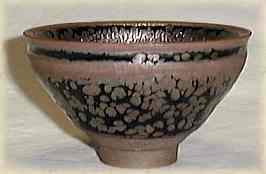 Kamada also makes tea bowls (chawan), incense burners (koro), large jars (tsubo), vases (kabin), and fresh water jars (mizusashi).